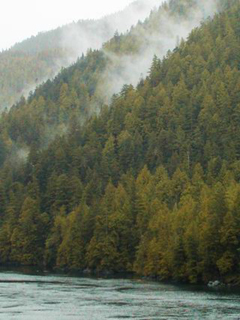 In May 2003 we took a one-week Alaskan cruise on Carnival Cruises' Spirit. 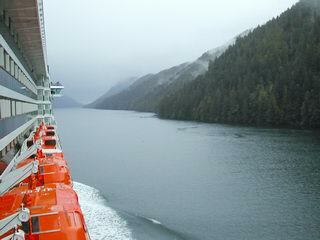 The cruise started in Vancouver, British Columbia and sailed Alaska's Inside Passage with stops in Juneau, Skagway and Ketchikan. As on previous cruises, we were very lucky with the weather. Prior to departure, the weather forecast had predicted rain every day with temperatures in the 40s. But other than the first and last days of the cruise (both cruising "at sea" days) we had beautiful sunny days with temperatures around 60 degrees. 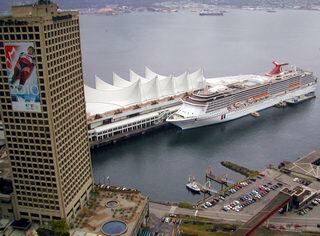 Our ship departed from Canada Place pier in downtown Vancouver. We could see that Vancouver was a beautiful city, and really wished we had scheduled an extra day or two for sightseeing. 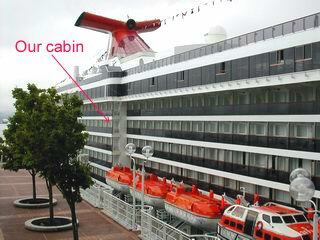 We had chosen a great balcony cabin, located at the forward end of the mid-section, which jutted out from the rest of the ship, giving us an unobstructed view looking forward. 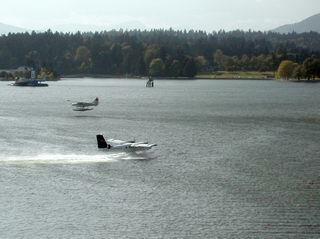 It was a busy harbor and we were surprised by the number of seaplanes. They turned out to be quite common at all the ports of call on our journey. 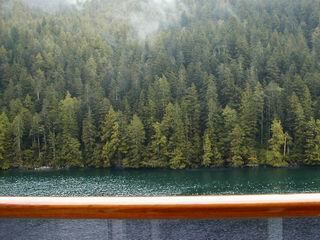 This was the view from our balcony as we began cruising the Inside Passage on our first day at sea. 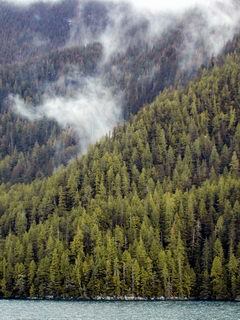 trees draped in heavy mist. for scale in this photo, but these trees were very tall. 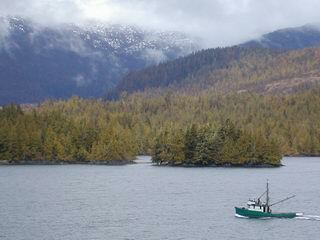 This lonely fishing boat was a long way from home, wherever home might be.